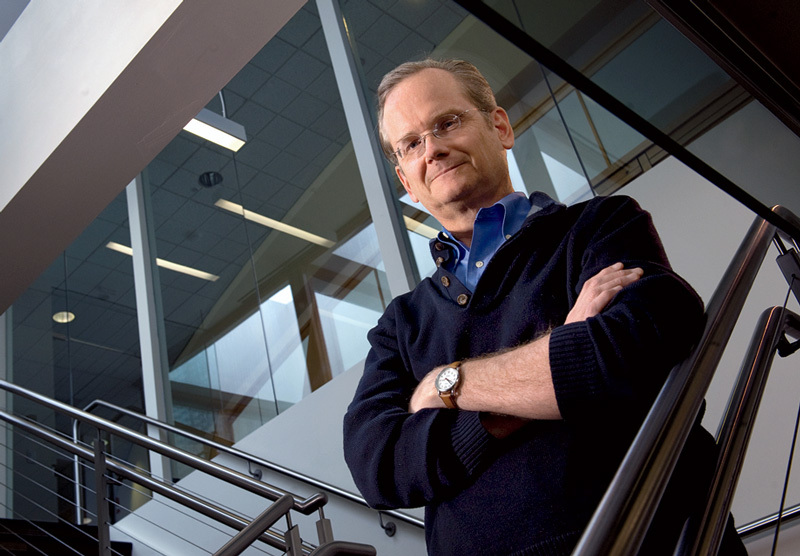 For a decade, Lawrence Lessig, a mild-seeming legal scholar, pursued the intricacies of updating American copyright law to reflect the rise of the digital era, the Internet, and new means of producing and disseminating texts, music, images, and software. Based first at Harvard, then Stanford, he co-founded organizations such as Creative Commons, a nonprofit that gives people legal tools to control use of their creative output, and argued that mashups (of songs or YouTube videos, for example) are culturally important products that (in some circumstances) can be legal under the principle of fair use. That set Lessig off in a new direction—including an exploratory, aborted run for Congress and, ultimately, in 2008, a return to Harvard. He now directs the Safra Center for Ethics, serves as Furman professor of law and leadership at Harvard Law School, and investigates the American government and what ails it. His findings, recently published in Republic, Lost: How Money Corrupts Congress—and a Plan to Stop It, have led him to conclude that nothing less than overhauling the way elections are funded—involving a tool never before invoked in American democracy—is required. Lessig comes to his conviction that American democracy is dysfunctional as a lawyer and citizen who has migrated from Reagan Republican to concerned liberal. His apprehensions about Congress transcend partisanship. He has worked with Tea Party leaders and Occupiers alike because he sees grass-roots intervention as the only way to fix a system that is broken. A host of issues threatens the nation, he points out, and every informed citizen knows it, yet Congress can’t achieve much. Elected representatives deadlock on key points such as reform of the financial system—after its failures nearly cause a global meltdown—even when solutions seem obvious and attainable. When Lessig contemplates this impasse, he sees political polarization as merely a symptom of a much deeper sickness: Congress has been “corrupted” by its members’ dependence on money from lobbyists—and from the special interests hiring those lobbyists—to fund their reelection campaigns. This “dependence corruption,” described in Republic, Lost, does not mean venal corruption: bribery or bags of cash for personal use. The Framers of the Constitution, he points out, sought to guard against that by explicitly outlawing the corrupting potential of gifts from foreign nations in Article 1. The Framers, Lessig says, had just one kind of dependence in mind for members of Congress: a dependence on the people. He quotes The Federalist (the then-anonymous essays by Alexander Hamilton, James Madison, and John Jay that are often used as a contemporary account of the Framers’ intentions) to make this point: number 52 describes the House of Representatives as that “branch of the federal government which ought to be dependent on the people alone” (emphasis added). But in the last two decades, Lessig writes, members of Congress have developed a fearsome dependency: campaign cash. The total amount spent on campaigns by all candidates for Congress in 2010 was $1.8 billion. Fundraising has become a way of life, and extravagant giving has been institutionalized; only the diamonds are missing. Lessig cites the example of Senator Max Baucus (D-Montana), chairman of the Senate Committee on Finance, whose position gave him a critical role in the debate over President Obama’s healthcare proposal. Between 2003 and 2008, Baucus received $5 million in campaign contributions from the financial, insurance, and health industries. But Lessig also cites similar examples from both sides of the aisle, blaming neither political party in particular. The corruption, he says, is systemic and systematic: in 2009 alone, lobbyists spent $3.5 billion, or about $6.5 million per each elected member in Congress. Furthermore, Americans don’t believe all that money has no effect—and that is a problem in itself. If the 99.9 percent of Americans who don’t have enough money to buy access to Congress believe their participation in their democracy doesn’t count for much, he says, they will choose to do something else, such as make a rational choice to play with their children instead. The corrupting influence of money manifests itself in Washington culture in other ways as well. When Lessig interviewed convicted lobbyist Jack Abramoff as part of a series hosted by the Center for Ethics last December, for example, Abramoff described how offering a member of Congress or congressional staffer a high-paying job on K Street (home to big lobbying firms) is, in effect, a way of hiring them on the spot. They may be two years from the end of their terms, Abramoff said, but from that moment—with no money down—they are, in the back of their minds, working for their future employer. Lessig therefore suggests extending the ban on moving from Congress to a lobbying job from the current one year for House members and two years for staffers and Senators to seven years. The problem of money in politics runs deep, with effects that are difficult to untangle, but Lessig cites a particularly dramatic instance to illustrate his point. Between 1995 and 2009, he reports, the government spent more than $70 billion subsidizing corn production. As a result, “Every $1 of profits earned by [food conglomerate Archer Daniels Midland’s] corn-sweetener operation costs consumers $10,” says Lessig, quoting from a Cato Institute study. That conviction and the Supreme Court decision Citizens United v. Federal Election Commission (which allows corporations and unions unlimited spending on independent political communications) have led him to call for a constitutional convention—something that hasn’t happened since the Constitution was written—to propose amendments that would ensure Congress is truly dependent on the people alone. It seems an extreme approach, but Lessig discusses many other possible remedies and strategies for achieving them in his book, such as donor anonymity (to break the clear link between contributions and political favors) or one-issue candidates who vow to quit Congress once reformed. He follows those remedies down forking paths, seemingly to every possible outcome, and concludes that a convention has the best, albeit slight, chance of success. The Constitution describes a mechanism for triggering such a gathering (two-thirds of state legislatures must call on Congress to convene a convention, and three-quarters of the states, 38 in all, must ratify any proposed change for it to be adopted), but every time the country has faced the prospect, Congress has acted first, “most famously in the context of the Seventeenth Amendment” mandating direct election of U.S. senators by popular vote, Lessig reports. “The states came within one vote of calling for a convention” and Congress responded to this reformist pressure. Lessig does not say what, exactly, such a convention should propose. Elsewhere in Republic, Lost, he advances the idea of democracy vouchers, a publicly funded campaign-finance system that would give every citizen $50 to support his or her candidate of choice, and would limit total contributions from any single person to $100. But this system would apply only to candidates who “opt-in,” says the libertarian Lessig, leaving other candidates to take money from super PACs, corporations, or industry lobbyists. Yet it is a solution characteristic of Lessig, this former chairman of the Pennsylvania Teen Age Republicans who turned liberal while studying philosophy at the University of Cambridge in England—an unconventional, innovative, and radical thinker. His proposal in a single stroke does away with experts, politicians, and activists.